You know how time-consuming and costly tape roll changeovers can be. Even the slightest interruption to production can have a negative impact on your line efficiency and ultimately your bottom line. 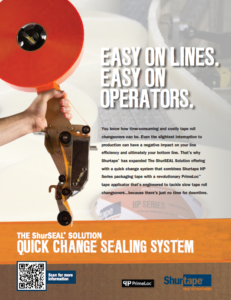 That’s why Shurtape® has expanded The ShurSEAL Solution offering with a quick change system that combines Shurtape HP Series packaging tape with a revolutionary PrimeLoc™ tape applicator that’s engineered to tackle slow tape roll changeovers…because there’s just no time for downtime.